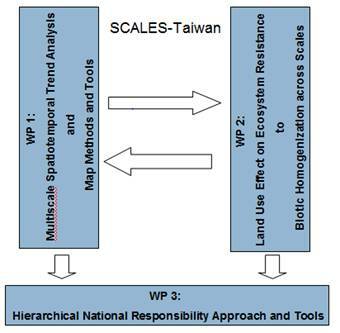 (1) The major purposes of SCALES-Taiwan are as follows: To integrate the issue scale into policy and decision making, as well as biodiversity (bird diversity) management in Asia and Taiwan scales. (2) To collaborate, exchange and share methods and results of the SCALES project. 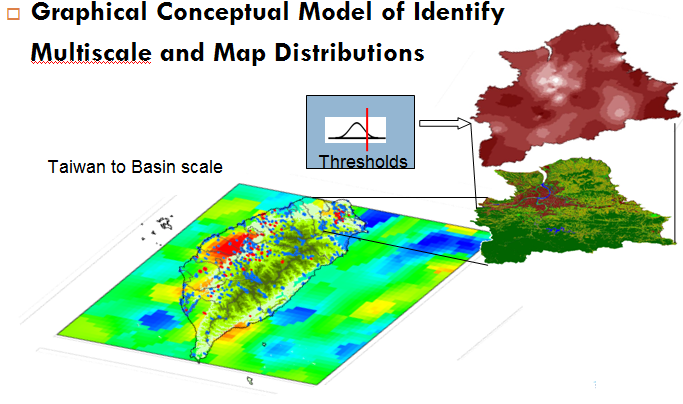 (1) To provide the most appropriate multi-scale spatiotemporal modeling and scale impact assessment tools, policy instruments and national responsibility assessment. To foster our capacity for bird diversity conservation across spatial and temporal scales and disseminate them to a wide range of users in Asia, including Taiwan. ¤ A model with factors affecting ecosystem’s resistance to avian homogenization at county, regional, city, habitat scales. ¤ Conservation planning guidelines for restraining biotic homogenization in focal area. ¤ Design guidelines for increasing native species and constraining aggressive/invasive species in focal areas. Lin, W.-C., Y.-P. Lin*, Y.-C. Wang, T.-K. Chang, L.-C. Chiang, 2014,Assessing and mapping spatial associations among oral cancer mortality rate, concentrations of heavy metals in soil, and land use types based on multiple scale data.11, 2148-2168. International Journal of Environmental Research and Public Health. (SCI)*:corresponding author. Lin, Y.-P.. 2014, Environments: A New Cutting-Edge International and Interdisciplinary Scholarly Open Access Journal. 1.1, 1-3. Environments. Wang, Y.-C. , Y.-P. Lin*, C.-W. Huang, H.-J. Chu, W.-S. Ou, Chiang, L.-C., 2012, A system dynamic model and sensitivity analysis for simulating domestic pollution removal in a free water surface constructed wetland. 223, 1719-1742,Water Air and Soil Pollution. (SCI) *:corresponding author DOI: 10.1007/s11270-011-10H. Henle K, Bell S, Brotons L, Clobert J, Evans D, Görg C, Grodzińska-Jurcak M, Gruber B, Haila Y, Henry P-Y, Huth A, Julliard R, Keil P, Kleyer M, Kotze DJ, Kunin W, Lengyel S, Lin Y-P, Loyau A, Luck GW, Magnusson W, Margules C, Matsinos Y, May P, Pinto I, Possingham H, Potts S, Ring I, Pryke J, Samways M, Saunders D, Schmeller D, Similä J, Sommer S, Steffan-Dewenter I, Stoev P, Sykes M, Tóthmérész B, Tzanopoulos J, Yam R, Penev L,2012, Nature Conservation – a new dimension in Open Access publishing bridging science and application. 1, 1–10, Nature Conservation. Lin, Y.-P., 2012, Sustainability of Ecosystem Services in a Changing World, 2, e111, Journal of Ecosystem and Ecography. Lin, Y.-P., C.-R. Chang, H.-J. Chu, B.-Y. Chen, 2011, Identifying the spatial mixture distribution of bird diversity across urban and suburban areas in the metropolis: a case study in Taipei Basin of Taiwan, 102, 152-163, Landscape and Urban Planning (SCI, SSCI). Lin, Y.-P., Y.-B. 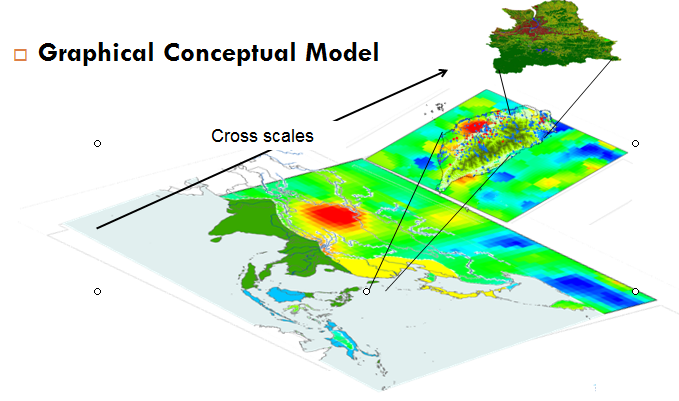 Lin, Y.-T. Wang and N.-M. Hong, 2008, Monitoring and predicting land-use changes and hydrology of an urbanized Paochiao watershed in Taiwan using remote sensing data, urban growth models and a hydrological model. 8, 658-680, Sensors (SCI). 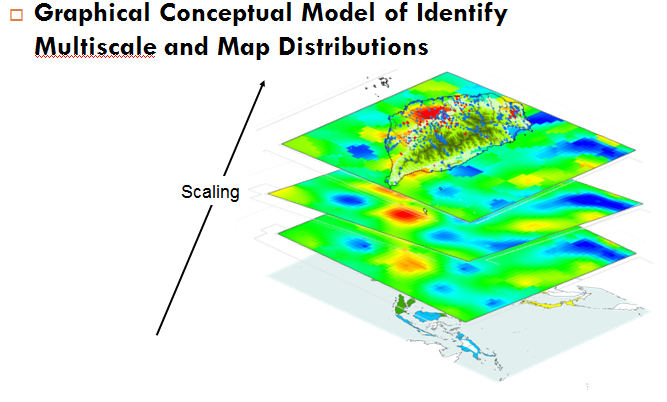 Lin, Y.P., 2008, Simulating spatial distributions, variability and uncertainty of soil arsenic by geostatistical simulations in Geographic information systems. 2, 26-33, Open Environmental Sciences. Lin, Y.-P., N.M. Hong, P. J. Wu, C.F. Wu and P.H. Verburg, 2007, Impacts of land use change scenarios on hydrology and land use pattern in the Wu-Tu watershed in Northern Taiwan. 80, 111-126. Landscape and Urban Planning(SCI, SSCI). Lin, Y.-P., T.K. Chang C.F, Wu, D. G. Chian and S.H. Lin, 2006, Assessing impacts of typhoons and the ChiChi earthquake on Chenyuland watershed landscape patterns in Central Taiwan using landscape metrics, Environmental Management, 38(1), 108-125. (SCI). Lin, Y.P., 2002, Multivariate geostatistical methods to identify and map spatial variations of soil heavy metals, Environmental Geology 42, 1-10. (SCI, EI)NSC 87-2621-P-002-012 and NSC 89-2621-B-002-004. Lin Y.P., T.K. Chang and T.P. Teng, 2001, Characterization of soil lead by comparing of sequential Gaussian simulation, simulated annealing simulation and kriging methods, Environmental Geology, 41(1/2), 189-199. Lin, Y.P. and T. K. Chang, 2000, Simulated annealing and kriging method for identifying the spatial patterns and variability of Soil heavy metal, Journal of Environmental Science and Health, Part A - Toxic/Hazardous Substance & Environmental Engineering, A35(7), 1089-1115. Wu, C.-F. and Lin, Y.-P., 2006, Spatiotemporal land-use change modeling for Hsi-Chi area, Urban and Planning, 33(3):231-259. Lin, Y.-P., Wu, C.-F. and Deng, D.-P., 2004, Landscape ecological dimension and metrics in land-use spatiotemporal pattern analysis, Urban and Planning, 31(3), 239-268. Lin, Y.-B., Tang, I.-C., Lin, Y.-P. and Liu, C.-W., 2004, Multi-scale analysis on groundwater induced by the Chi-Chi Earthquake, Taiwan Water Conservation, 25, 1-16. Lin, Y.-P., Dai, C.-F. and Wu, C.-F, 2001, Wetland Landscape Assessment of Tanshui River Estuarine Area- A Case Study in Waziwei Natural Reserve Area, Taiwan Water Conservancy, 49(2), p63-78. Teng, T.-P. and Lin, Y.-P., 2001, Using Fractal Dimension in the Study of Buildup Pattern in the Central Part of Taiwan, Human and Land, 209, p55-61.